Drift off to dreamland on the deliriously deluxe feel of down pillows. Sumptuous 400 thread count cotton is supremely soft and cozy, giving your head the perfect cradle for a most heavenly sleep experience. Very happy with these down pillows. I fluffed them up a few times and let them air out after I took them out of the package. Very comfortable! They are used as the extra set of pillows on my king sized bed. I have them protected with the pillow covers that I also purchased here. They are medium soft and they are comfortable. Not firm or hard. They adjust well for me. Feather pillows are fantastic. Especially when they come in a set of two! Feathers are soft and comfortable. When they need to be fluffed, just shake them and they're perfect! I was surprised to receive both pillows in one very compact bag! But, they fluffed up right away. Unfortunately, they compress again rather quickly. The 400 thread count cover keeps the feathers in effectively. All in all, I think they were a good purchase. These are not as good a pillow as we have had in the past. Guess you get what you pay for! They don't 'rebound' like a high quality down pillow is supposed to. High quality fabrics. 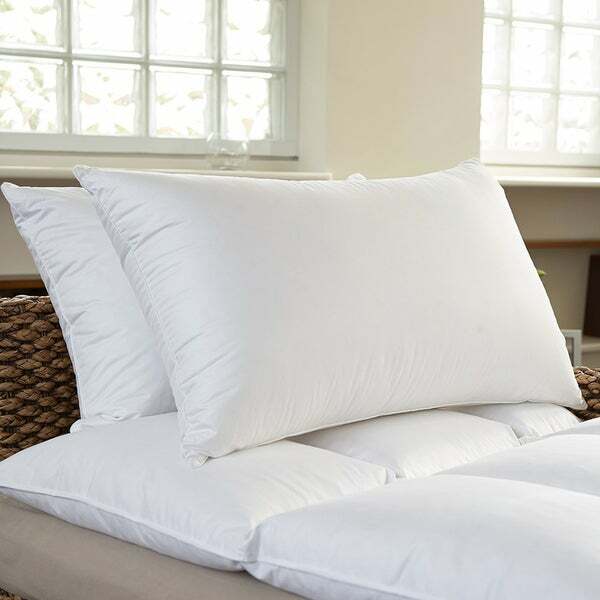 Only disadvantage is they deflate midway through night so they act more like a feather pillow, so if you like feather, this is a good quality one. Pillows are awesome.....so I ordered these for the kids room & they fit perfect. They are very soft & comfortable. The fabric feels good with or without a pillow case. Its not like those in hotels. They are not real feathers. They come out of the pillow and the shafts are sharp and can poke you. WORST pillow in the world. I never thought sleeping on feather and down could feel like a brick. Don't buy it. When they arrived, they seemed overstuffed and a little bumpy. Haven't used them yet, but may use them with a pillow cover in a bed set. The pillow would have been great. But the feathers poke through. So I am replacing the ticking so that the feathers don't poke out. Very soft and cozy. Crisp, warm, not to warm, cozy, relaxing and make you never want to leave your bed. Exactly what we were looking for. Almost hotel quality. I would buy these again. VERY STIFF, & NOT Plush & Cozy. You DON’T find out they’re ONLY 5% Down & 95% Feather, until they Arrive. Was hoping for comfort like in hotel but a little noisey but still for price they are great! The pillows are fluffy, but sound a little crispy at first. But They are comfortable to sleep on, and they'll break in nicely I'm sure. Appeared to be the size and quality I was looking for. Excellent price and shipping. guide helpful in understanding difference between down and feathers...cotton thread count...washability.